Himanshi Nigam from Indore, B.E. - B.Tech Graduate. Himanshi Nigam is Software Engineer and currently have no work experience. RUBY ON RAILS DEVELO.. MYSQL & JQUERY FULL STACK DEVELOPER..
are one of expert skill area's of Himanshi Nigam . 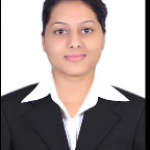 Himanshi Nigam is working in IT Software industry.